“It’s death to farm out here, it’s worse than death in the mines; you want them to sing bloody opera as well?” Doc (played by Donald Pleasance, qted by Kaufman, p. 26). Tina Kaufman notes in her study of Wake in Fright (Australia/USA 1971) that this film and Walkabout (UK 1971) screened as Australian entries at the Cannes Film Festival in 1971, yet they were both directed by “outsiders” (p. 11)—a Canadian, Ted Kotcheff, and a Brit, Nicholas Roeg. Kaufman’s volume is part of the Australian Screen Classics series that includes some fine contributions on individual films such as Adrian Martin’s remarkable study, The Mad Max Movies. The series endeavours to offer a space for the elucidation, scrutiny and commemoration of Australia’s national film heritage. Due to the international reputation of many of the films discussed, the series ensures its appeal to more than just a national audience. 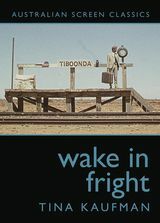 A study of Wake in Fright must be considered in this context, a film which, on its original release, had much greater success with audiences in Paris and London than it initially had in Australia. Its restoration and celebrated re-release 38 years later in 2009 at the Sydney Film Festival was, however, a revelation to a new generation of film-goers and a reminder to an older one of a vital period in the history of Australian cinema. Before proceeding to review the book, it seems important to acknowledge the author, Tina Kaufman. For those of us who work in screen studies or are involved in the screen community in Australia, Kaufman has played a long and significant role as a passionate supporter of the local culture. A freelance journalist, she worked for 17 years as the editor of the now defunct independent newspaper Filmnews; she regularly publishes in Metro and other journals, is a founding member of the Film Critics Circle of Australia and has also been a board member of the Sydney Film Festival. Kaufman’s decision to make the focus of the book the “story behind the film” (p. 10), rather than the film itself, was an insightful one as it enables her to bring to the foreground her involvement in the vibrant period that enabled the production of this important film. Kaufman’s volume tells the story of Wake in Fright through four chapters based around: “how it got made, how it got lost [and] how it got found, and how it was restored” (p. 10). The last chapter deals with the reception of the film in the early 1970s and since its celebrated public screening in 2009. Through a survey of reviews published on its original release, Kaufman helps to rectify perceptions that the film was not only unpopular with Australian audiences but also critics. While most critics described the film as bleak and unrelenting, they also found it undeniably insightful about an element of Australian masculine culture. (p. 54) The previous three chapters benefit greatly from fresh interviews undertaken during the film’s restoration and re-release. The examination of the “story behind the film” greatly benefits from Kaufman’s many discussions with the director, Kotcheff. The author’s approach is personal and, at times, the story has an autobiographical tone. The introduction discusses her friendship and association with individuals such as Albie Thoms, Aggy Read, John Clark and Richard Neville, helping to recreate a picture of the vitality and creativity that was a part of Sydney in the 1960s and early 1970s, an environment that helped nurture the regeneration of the Australian feature film industry. Chapter 1 outlines the fluctuations in the industry’s history and surveys how this period saw its revival through significant government support of funding efforts, such as the setting up of the National Film School, The Australian Film Development Corporation and the Experimental Film and TV Fund. While the use of international talent in the industry during this period is not always perceived in a positive light, Kaufman sees this moment as one of cross fertilization where “ideas, energies and talent” (p. 16) were free-flowing. The ‘detective story’ tone of Chapter 3 traces how the film was lost and then found. From the history of the film’s production, this chapter takes the reader into the broader context of film history, describing its patchy nature due to the loss of many productions. On its release in 1971, Wake in Fright screened in a few major cities then effectively disappeared. Instigated in the 1980s by the NFSA (National Film and Sound Archive) the “Last Film Search” resulted in many finds including 300 hundred feet of Australia’s first feature The Story of the Kelly Gang (Australia 1906). In 1996, NLT Productions’ Bobby Limb, began the search for Wake in Fright; however, it was the film’s editor Tony Butler who concluded it. Through Harvey Rappaport at the US TV network CBS, Buckley located 200 reels in a container marked for destruction. The reels arrived back at the NFSA in September 2004 where the process of restoring the film began. The intricate legal history of ownership and distribution rights is also outlined.